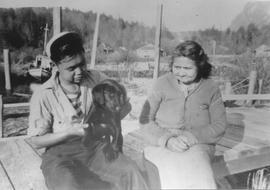 Left to right: Ernie and Harriet Harry (Peḵultn Siyam and Tsawaysia) across from Stamish Creek. 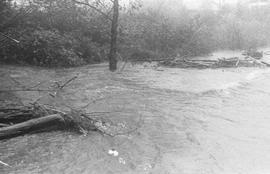 Flooded road in Valleycliffe caused by overflow of Stawamus Creek in October 1981. Harriet Harry (Tsawaysia) barbequing salmon 'Squamish Nation Style' at the Sta-a-mus Reserve. Left to right: Austin Harry (XwaXwalkn), Molly Harry (Yo-so-solt), George Harry (Xwach-la-nexw), Ernie Harry (Pekultn Siyam). Heading north towards Squamish from Sta-a-mus Reserve. Merrill & Ring 4 Spot with low built steel laying flatcar, ~1928 in Stawamus Valley. Climbing 6% grade on branch that ran south to Bughouse Heights.Photo by: Ed Aldridge. Moses Billy (Siyamshun) working on a dugout canoe at Sta-a-mus Reserve. It would be a river canoe.Moses Billy, of Squamish Nation, lived in Sta-a-mis in the early 1900's. Newport School with a view of the Chief in the background.